Cross laminated timber can be defined as a prefabricated solid engineered wood panel that is made up of two or three bonded layers of solid-sawn lumber. This lumber is bonded together with the help of adhesives as well as with beech screws or dowels and aluminum nails. This process helps provide shape to the wooden panels and can be further used for roof, floor, or wall applications. Cross laminated timber is a largesized building material that is generally used for applications such as residential buildings, educational institutes, government buildings, and industrial and commercial spaces. Cross laminated timber is used as a sustainable building material and is considered a sustainable solution as compared to concrete, structural steel, and load bearing bricks and block construction. Cross laminated timber is manufactured from timber, which is easily recyclable. Cross laminated timber was first introduced in Europe in the early 1990s. Since then it has been used all over the world due to its favorable properties. The development of cross laminated timber started in Switzerland, Germany, and Austria. During the development stage, only two layered timber structures were used for roofing systems. This two- layered timber structure was only used to construct residential buildings. However, research and development, wide acceptance of the product, and initiating building codes helped increase demand for cross laminated timber for non-residential applications. Cross laminated timber has various advantages over concrete and steel. It is considered as an advanced building material in the construction industry due to its superior properties. Cross laminated timber helps reduce risks at construction sites. It reduces the impact of construction activity on the environment and decreases disruption in local communities. The prefabricated nature of cross laminated timber helps in completion of the construction process within a few days as compared to other building materials such as cement, brick, or steel. Cross laminated timber is generally assembled on site, where it is connected by the means of mechanically fastening systems such as bolts, lag bolts, self-tapping screws, etc.. This allows the reduction of labor costs as well construction time of buildings. Cross laminated timber also provides safety against fire. Its properties such as low density and high permeability offer heat insulation and protect the wood. The demand for cross laminated timber has increased due to awareness about deforestation and climate change in the construction industry worldwide. In most of countries, forest and climate sustainability is on the priority list. Thus, government agencies, timber trade federations, and large construction companies are promoting the usage of cross laminated timber in more and more construction projects. Cross laminated timber reduces fresh water consumption. It enhances indoor environment quality, which helps in the sustainability of the environment. It also helps in keeping the environment clean by generating zero waste during its production. Cross laminated timber has wider usage in Europe as compared to other regions in the world. Since cross laminated timber is a new material, there is little specific technical documentation regarding the erection of structures designed and built with cross laminated timber panels. The technical documents currently available mostly are related to the European and North American region. Therefore, design professionals, builders, architects, etc. from other parts of the world find the documents insufficient and incomplete to help them utilize cross laminated timber in their construction projects. In most parts of the world, concrete and steel are largely used as compared to cross laminated timber. Some governments do not allow the use of wood as a structural material to construct high storey buildings. In the U.S., the International Building Code (IBC) limits wooden buildings to four stories. A major restraint in using cross laminated timber is the lack of knowledge about the material in the construction industry in most parts of the world. Another significant barrier in using cross laminated timber is overcoming the testing of housing systems for fire resistance and acoustics. There are gaps in public knowledge regarding cross laminated timber as it is still a new product. Awareness about the material is still uncommon in most of the parts of the world such as Latin America, Middle East, and Asia. Many contractors, building owners, and construction professionals believe in myths regarding cross laminated timber such as structures made from the material cost more than concrete structures, the fire resistance of cross laminated timber structures cannot replicate the performance of concrete, cross laminated timber cannot survive a major earthquake, etc. Most of the cross laminated timber production takes place in Austria and Germany, where prominent companies such as Stora Enso, Binderholz Bausysteme GmbH, and Mayr-Melnhof Holz Holding AG are located. Germany, Austria, Switzerland, the U.K., and Italy constitute more than 50% market share of the global cross laminated timber market. Additionally, the cross laminated timber market in the U.S. and Canada is driven by demand from architects and engineers for the usage of wood-based building products and building systems. Previously in the U.S., the usage of wooden buildings was restricted to three to four stories due to regulations of the International Building Codes. However, wide acceptance of the product and development in building codes have facilitated further usage of cross laminated timber for high rise buildings. Cross laminated timber is a new generation engineered wood that was developed in Europe. It was first developed and used in Germany and Austria in early 1990s. Cross laminated timber is also known as X-lam and massive timber. It is a prefabricated engineered wood panel that is made up of three to four layers of solid-sawn lumber or composite lumber. This composite lumber is well laminated with gluing of longitudinal and transverse layers with structural adhesives to form a solid rectangular shaped straight and plane timber. Cross laminated timber was first developed and used in Germany and Austria. In the 2000s, Cross Laminated Timber was much widely used in Europe. Cross Laminated Timber has many applications in walls, roofs, and ceilings. The thickness of the timber can be changed according to the requirements of the application. It is an eco-friendly product, which is used as a sustainable material in various building systems such as single-family and multi-storey housing, etc..
Cross laminated timber is used as a substitute for concrete and steel. While constructing a building, it is important for materials to be reliable, durable, and have longevity. Despite being five times lighter than concrete, CLT has comparable strength per weight ratio to concrete. The multi-layer wooden panel of the timber spans in two directions. Each layer is placed cross-wise to the adjacent layers to increase its stability and strength. Buildings using Cross Laminated Timber carry the same strength as concrete, while minimizing cost and construction time. Cross Laminated Timber also outperforms in earthquake zones. Buildings using cross laminated timber are cost competitive as compared to those built with steel and concrete. Prefabrication helps in contributing to cost savings in Cross Laminated Timber. It also helps to coordinate designs, manufacturing, and on-site construction. Overall project costs are reduced because the construction schedule is shorter and materials are brought to the site ready to be installed. In terms of type, the global cross laminated timber market can be classified into adhesive bonded CLT and mechanically fastened CLT. Based on application, the global cross laminated timber market can be segmented into residential buildings, educational institutes, government/public buildings, and industrial and commercial spaces. 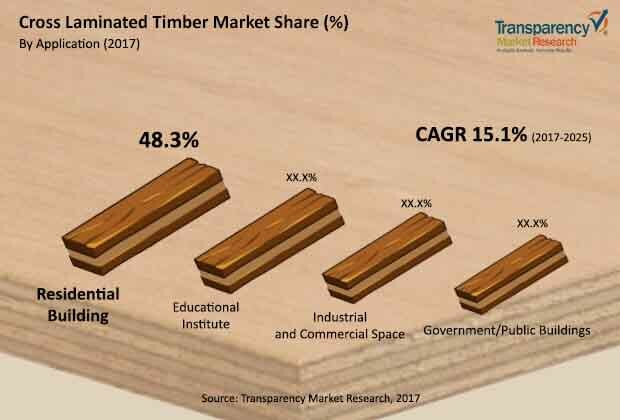 Rise in demand for sustainable building materials, positive developments in the green building movements, and changes in international building code are key factors driving the global cross laminated timber (CLT) market. In Europe and North America, cross laminated timber has become a preferred product in the construction of residential buildings. As the construction industry in Europe and North America has shifted its focus to a sustainable approach in constructing residential buildings, demand for cross laminated timber has risen Light frame wood (LFW) construction is the most commonly adopted construction type in the residential housing sector. Constant research activities in the construction and wood industries are likely to create new opportunities for cross laminated timber manufacturers. The North American Advisory Committee on cross laminated timber along with its Research and Standards Sub-committee, were formed specifically to develop a roadmap for code adoption for the usage of cross laminated timber for other applications such as educational institutes, industrial and commercial spaces, and government and public buildings. The report analyzes and forecasts the market for cross laminated timber at the global and regional level. The market has been forecast based on revenue (US$ Mn) from 2017 to 2025. The study includes drivers and restraints of the global cross laminated timber market. It also covers the impact of these drivers and restraints on demand for cross laminated timber during the forecast period. The report also highlights opportunities in the cross laminated timber market at the global and regional level. The report comprises a detailed value chain analysis, which provides a comprehensive view of the global cross laminated timber market. Porter’s Five Forces model for the cross laminated timber market has also been included to help understand the competitive landscape. The study encompasses market attractiveness analysis, wherein end-users are benchmarked based on their market size, growth rate, and general attractiveness. The study provides a decisive view of the global cross laminated timber market by segmenting it in terms of type, application, end-user, and region. These segments have been analyzed based on the present and future trends. Regional segmentation includes the current and forecast demand for cross laminated timber in North America, Europe, Asia Pacific, Latin America, and MEA. The report also covers demand for individual end-user segments in all the regions. The study includes profiles of major companies operating in the global cross laminated timber market. Key players profiled in the global market include Stora Enso, Mayr-Melnhof Holz Holding AG, Binderholz Bausysteme GmbH, KLH Massivholz GmbH, HASSLACHER Holding GmbH, Structurlam Mass Timber Corporation, Nordic Structures, Ed. Züblin AG, Eugen Decker Holzindustrie KG, Sterling Lumber Company, and W. u. J. Derix GmbH & Co. The report provides the estimated market size of cross laminated timber for 2016 and forecast for the next nine years. The global size of the cross laminated timber market has been provided in terms of revenue. Market numbers have been estimated based on type, application and region. Market size and forecast for each major type and application have been provided in terms of global and regional markets.